Don't forget, I'll start posting tutorials for making dollhouse miniature food in 1:12 scale in 2011 and they'll all be on my Caro Home Crafts blog and channel, so look out for them! 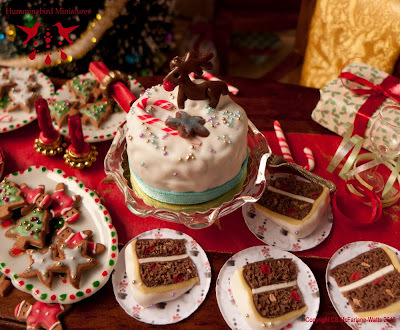 For a 15% discount on any item in my Christmas Range until Jan 5th 2011, just use the coupon code RUDOLPH in the promo coupon code box in my Etsy checkout. Don't forget, only my CHRISTMAS RANGE is available until the beginning of Jan 2011 and also everything is shipped from the UK until that time. 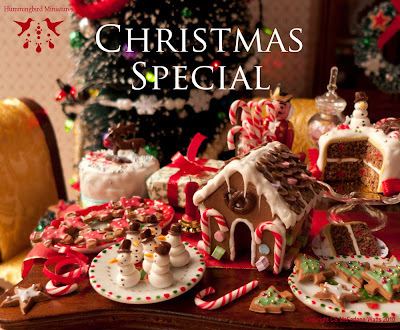 This offer is on my Pixie Dust Miniatures shop too. Scroll down for the CHRISTMAS RANGE. SHOP CLOSING IN 24 HOURS! 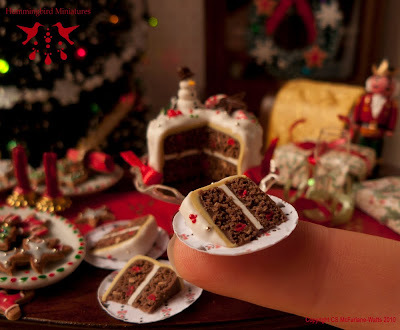 Just to remind you that I am closing both my Hummingbird Miniatures and Pixie Dust Miniatures shops in approx 24 hours so I can travel from America back to England for the holidays. 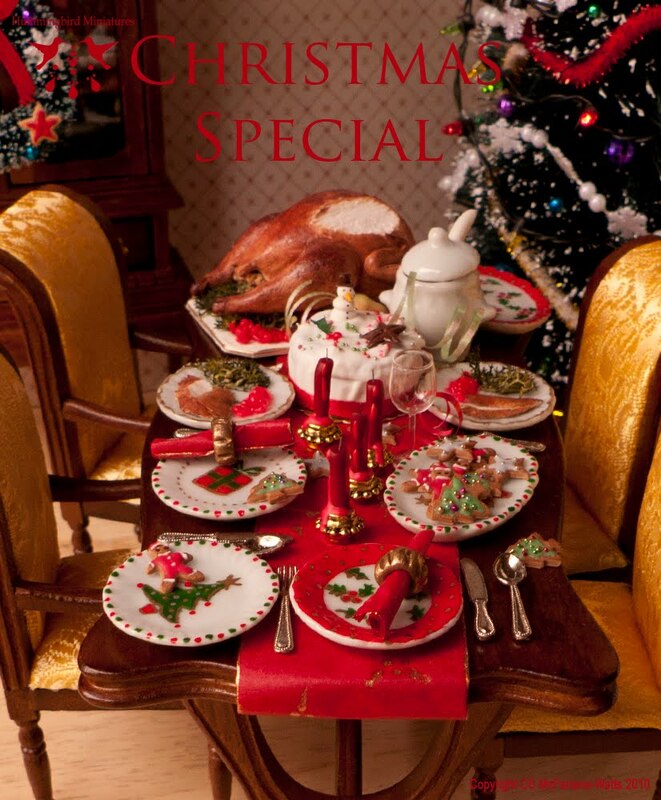 I'll re-open for business in 2 days or so (when jet lag has worn off and I've reached my parent's house) and everything will be dispatched from England until Jan 2011. 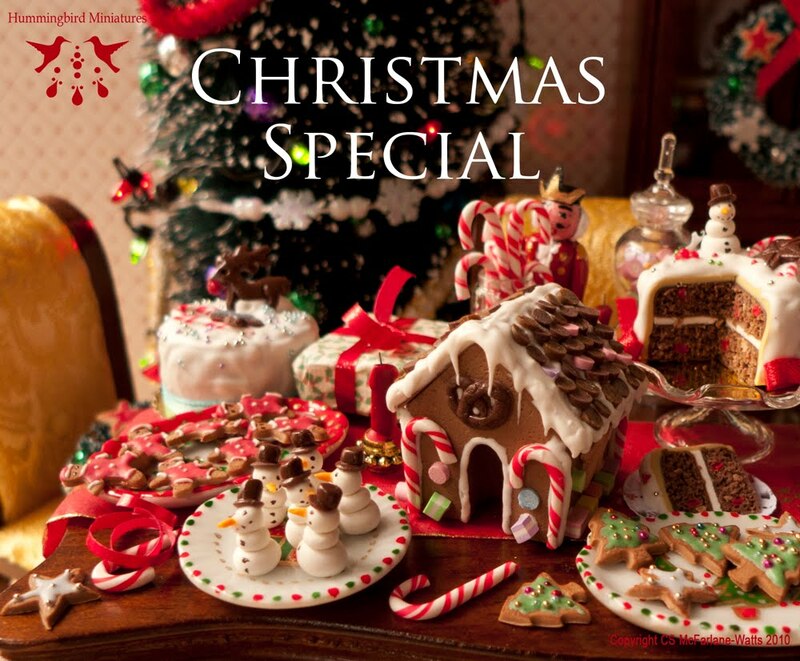 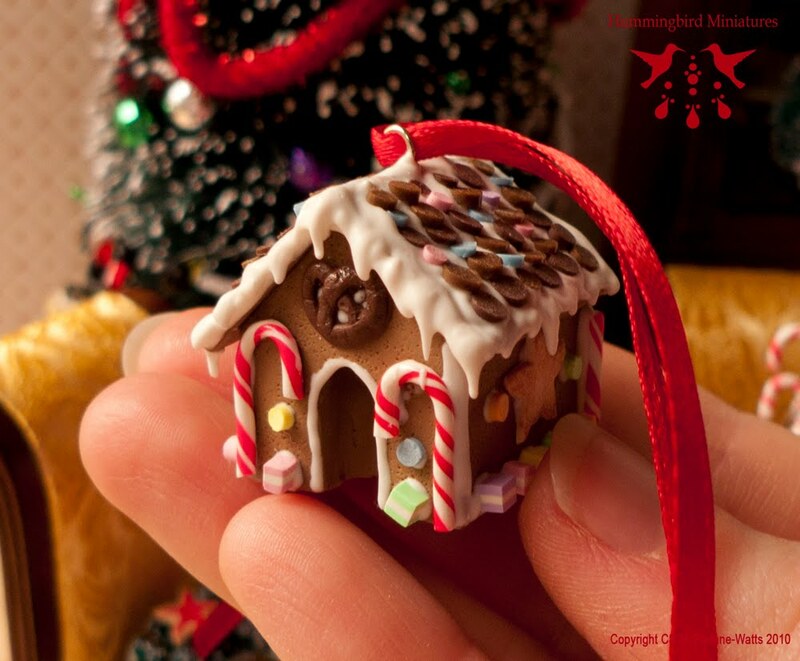 This is my favourite Hummingbird Miniatures Christmas range item - it's a Gingerbread House Tree Ornament (Decoration) and you can find it at both shops here and here . 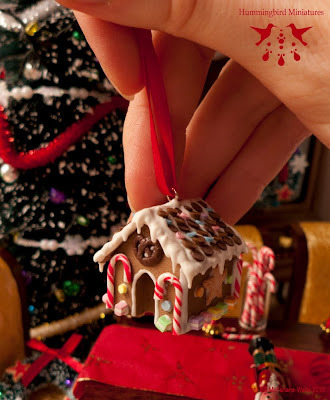 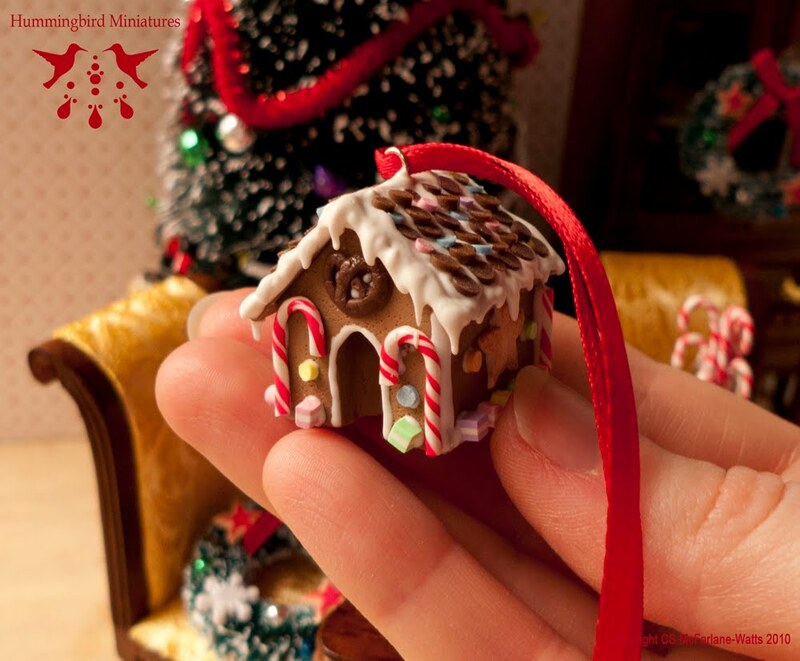 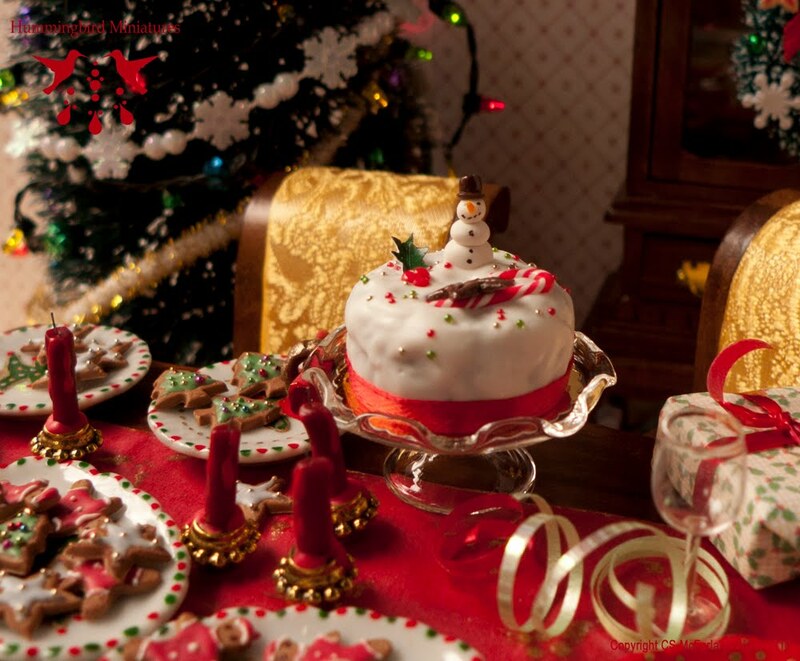 Incredibly detailed in 1:12 scale (and made from polymer clay), the gingerbread houses hang from little red satin ribbons which hang nicely on your Christmas tree branches! 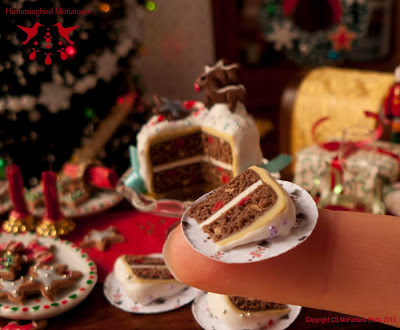 You can see more pictures, and pictures of the 'Christmas elf making process' on my other blog Pixie Dust Miniatures here . 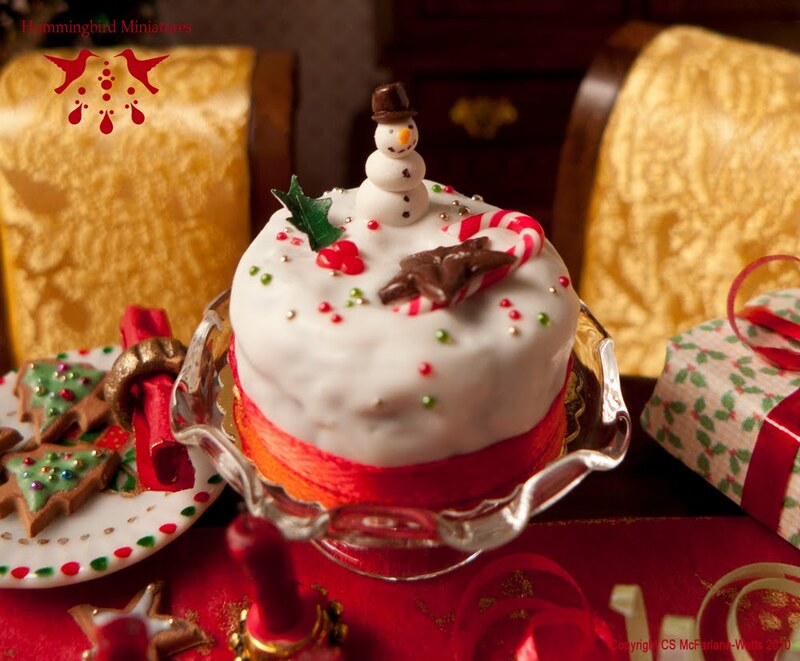 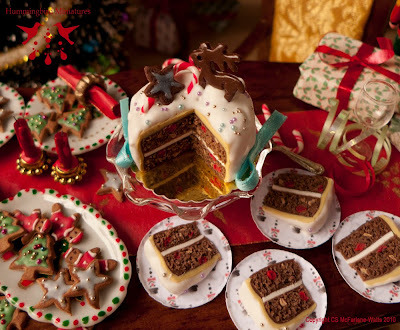 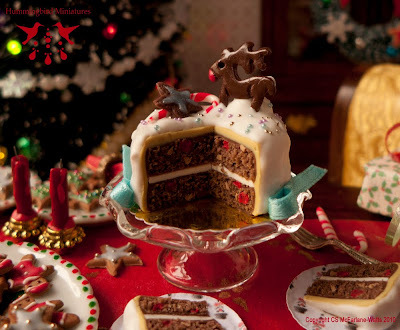 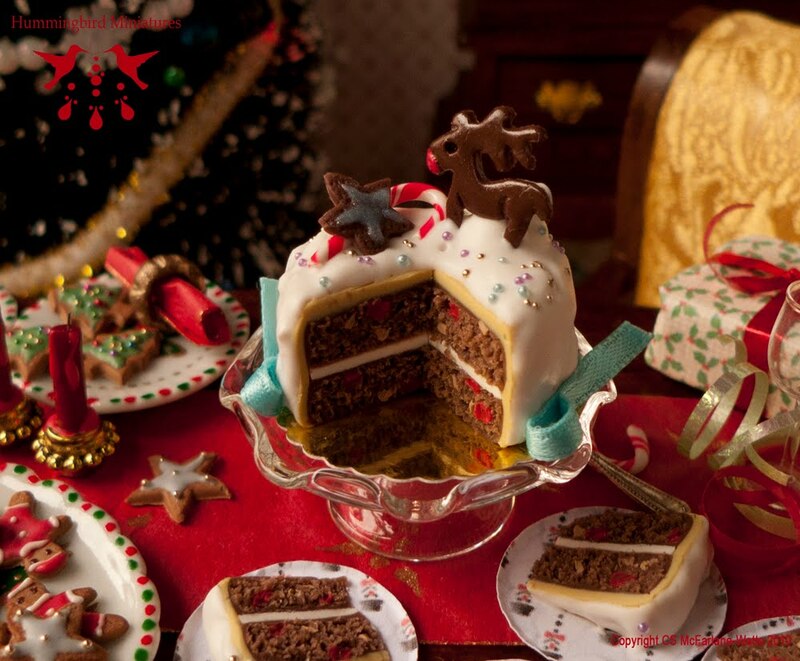 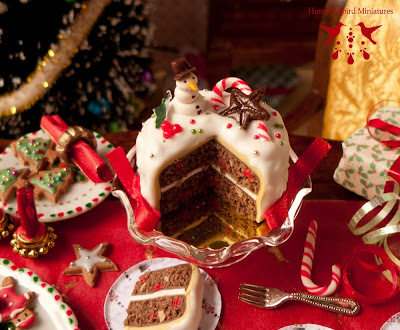 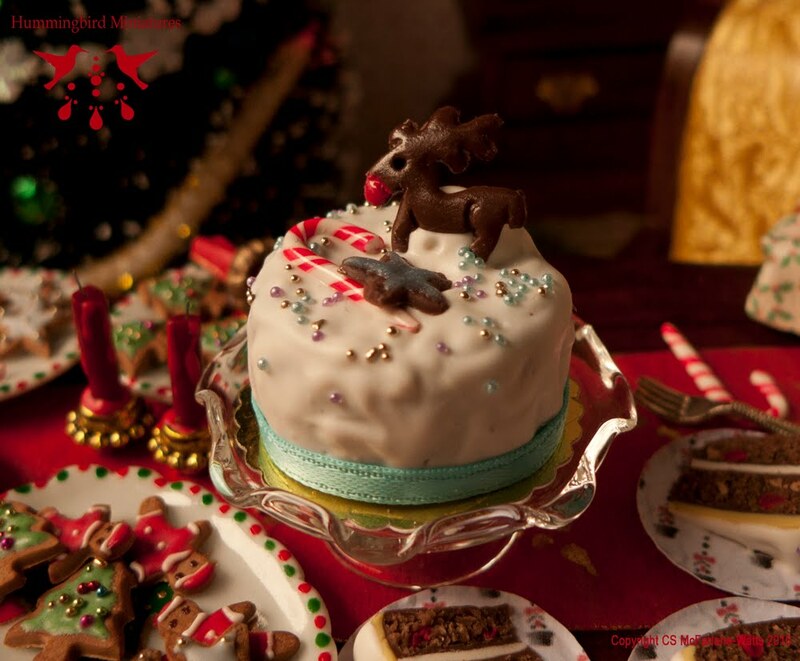 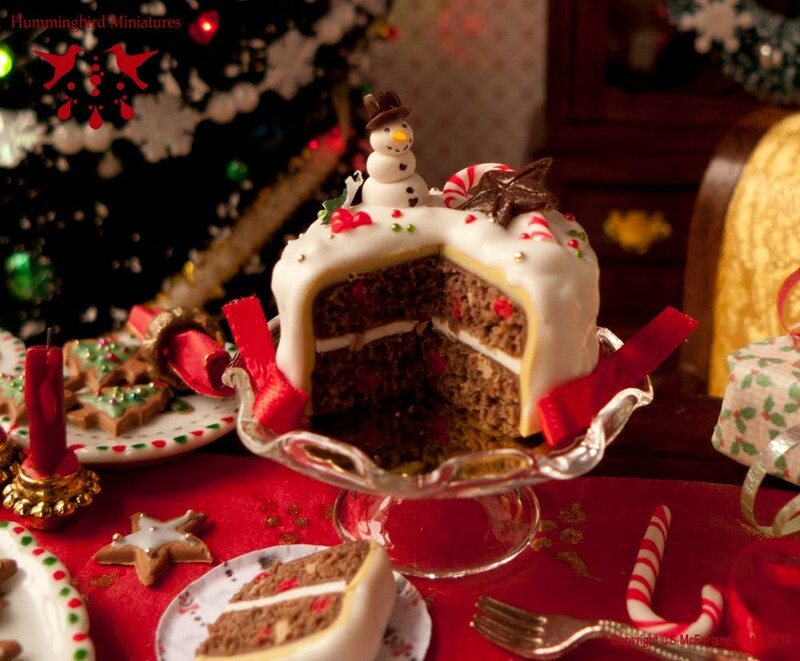 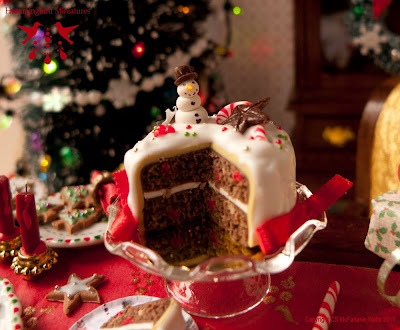 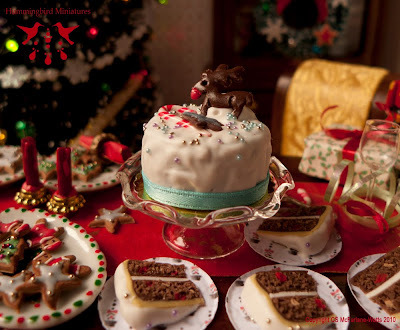 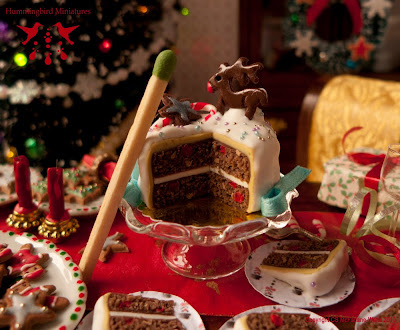 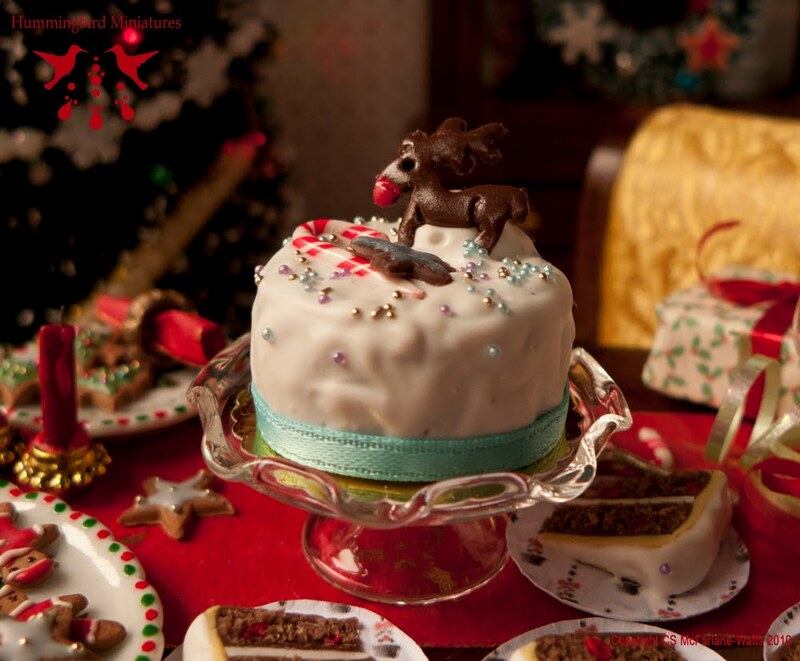 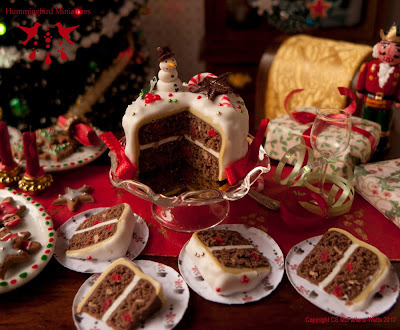 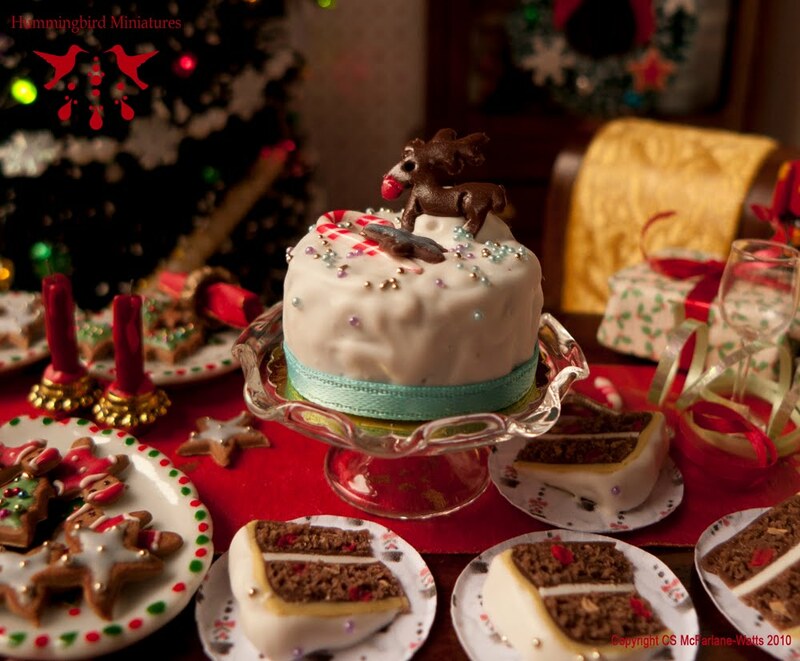 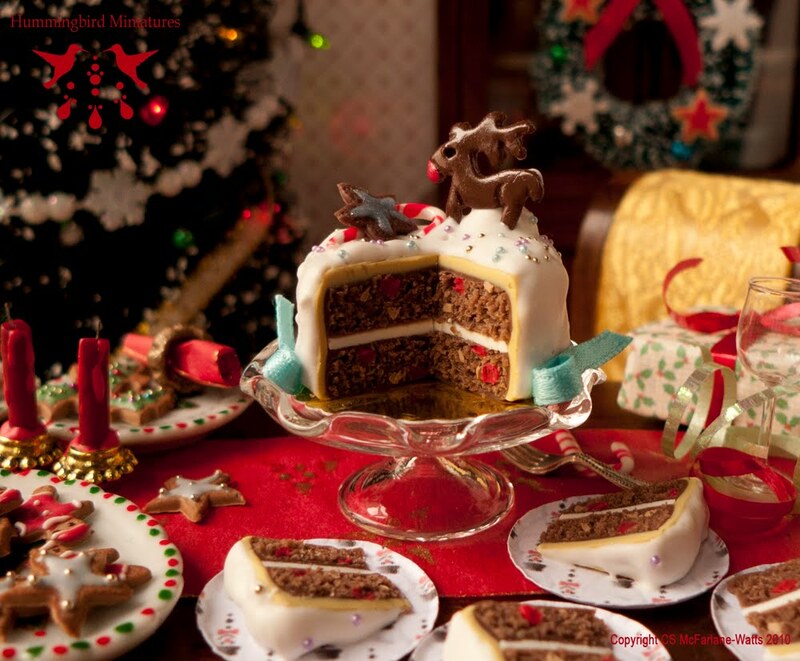 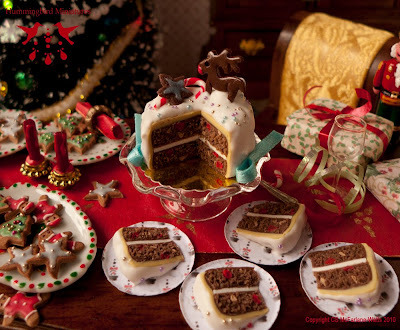 My employee elves have been making lots of Christmas Cakes, and I've included some photos here of my special Rudolph Christmas Cakes for you to see. 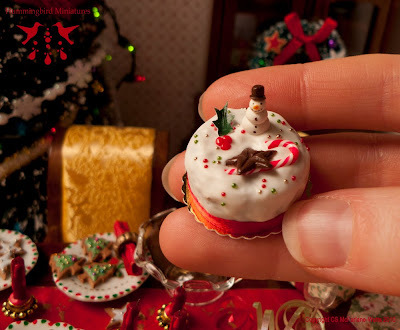 You'll be able to see pictures of HOW THEY WERE MADE by clicking over to my Pixie Dust Miniatures blog here ! 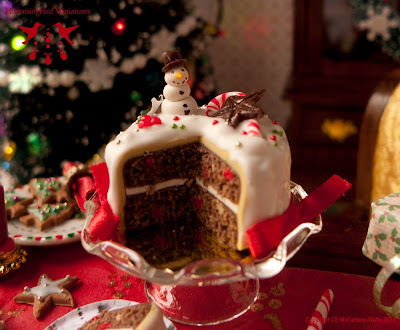 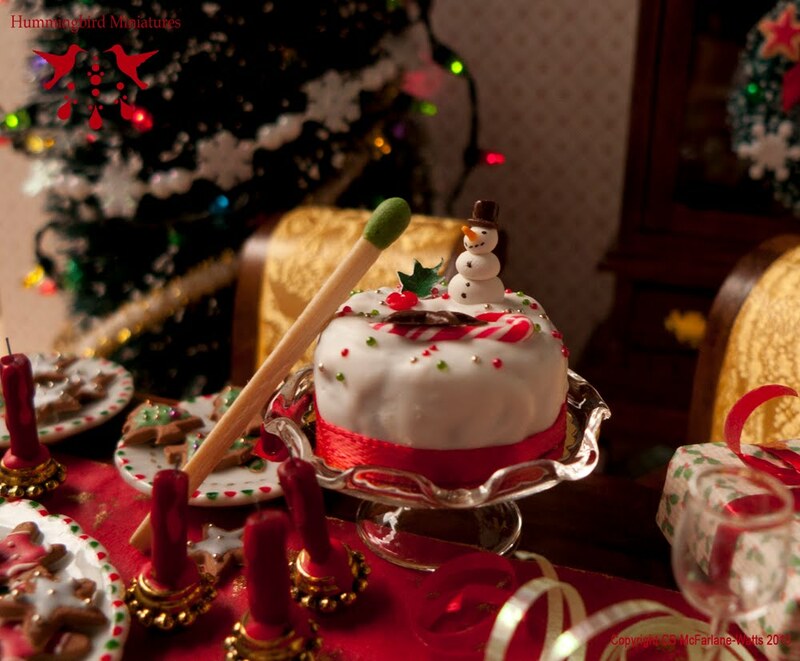 These cakes were lovingly handmade in 1:12 scale from polymer clay. Decorated with a chocolate Rudolph, frosted cookie star, candy cane, frosty sprinkles, white sugar icing and finished with a pale blue satin ribbon. 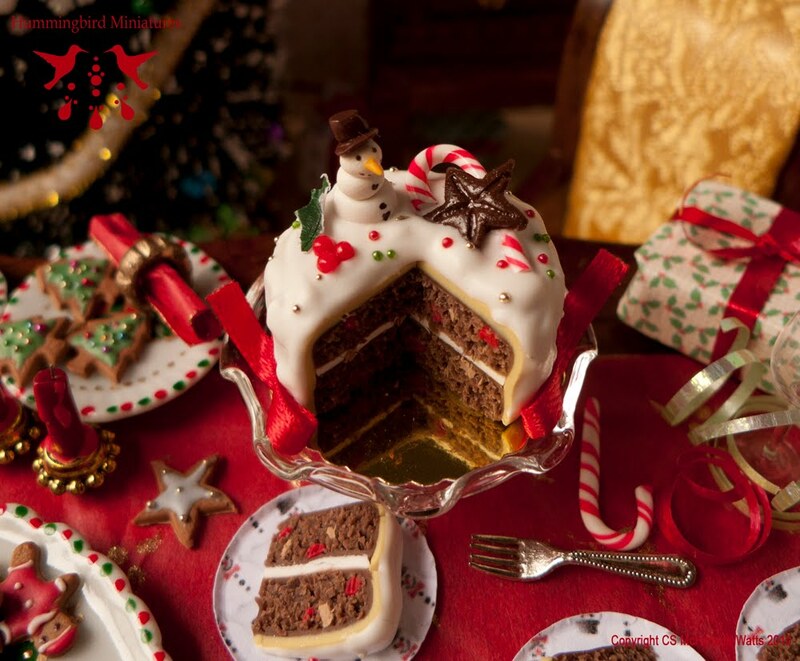 The cake sits on a gold cake board which it is attached to. 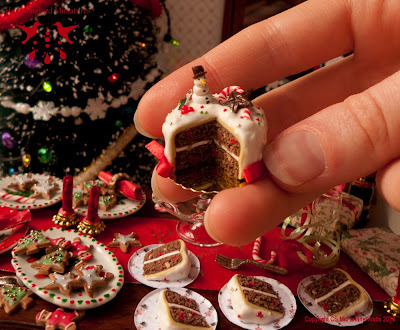 These cakes were lovingly handmade in 1:12 scale from polymer clay. 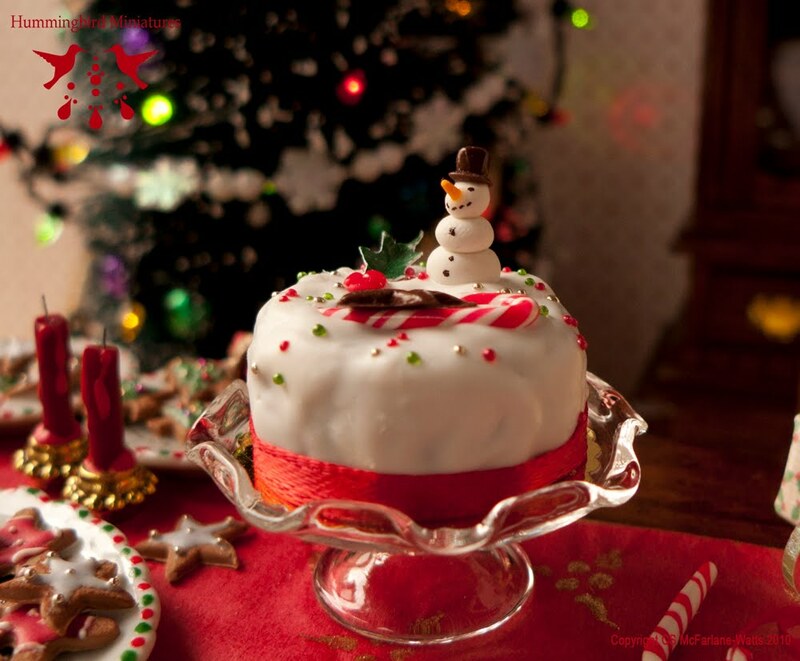 Decorated with a tiny sugar snowman wearing a chocolate top hat, candy holly berries, chocolate star, candy cane, Christmas sprinkles, white sugar icing and finished with a red satin ribbon. The cake sits on a gold cake board which it is attached to. 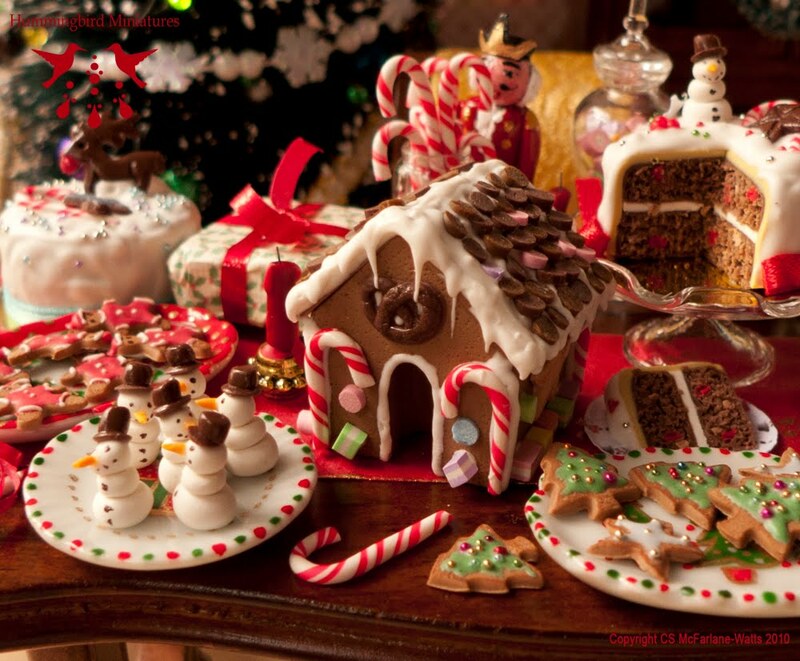 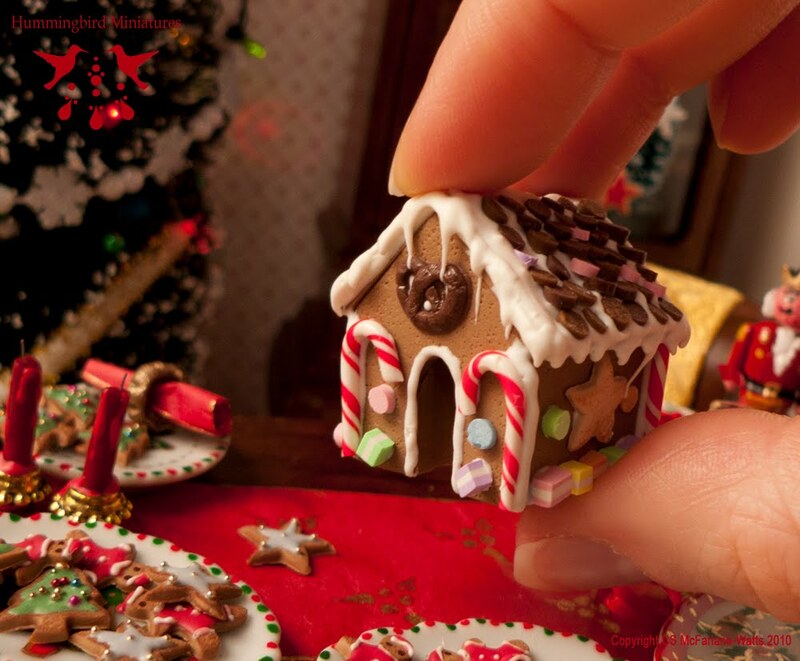 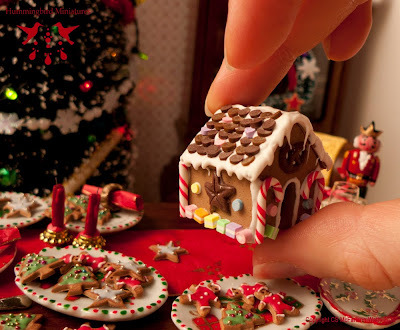 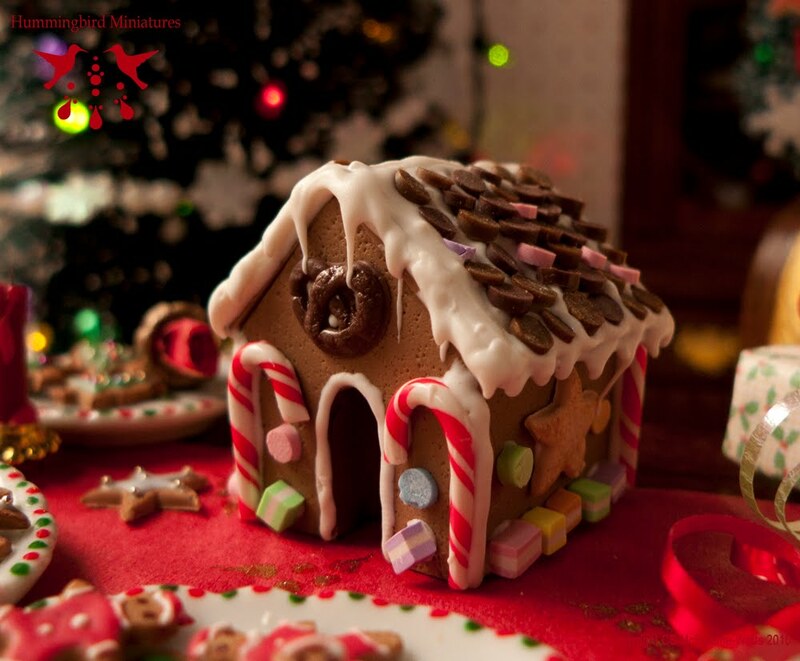 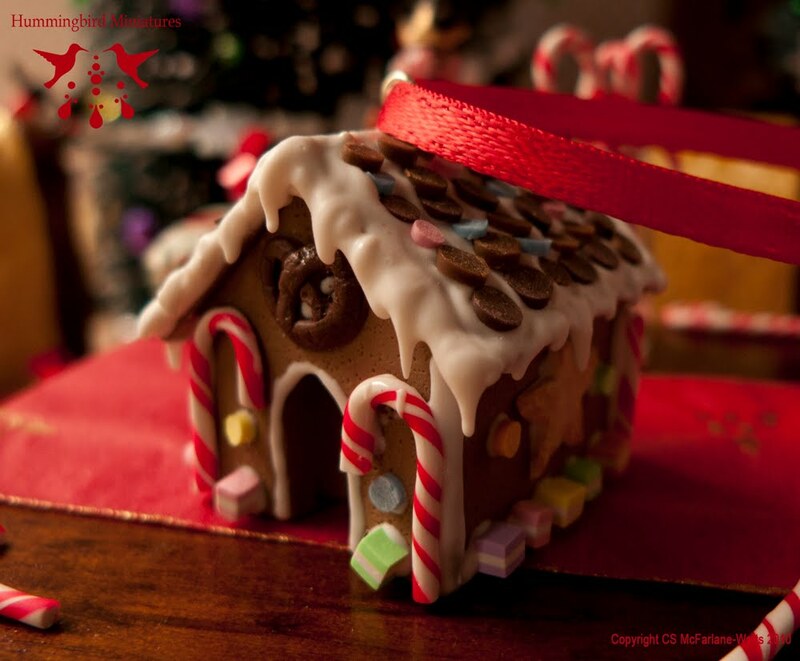 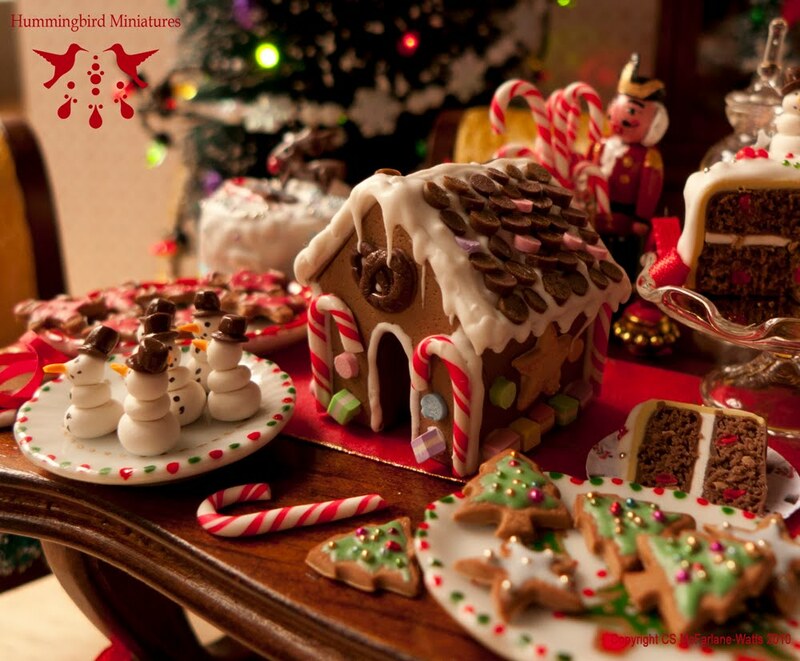 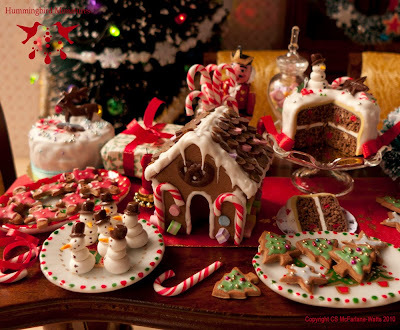 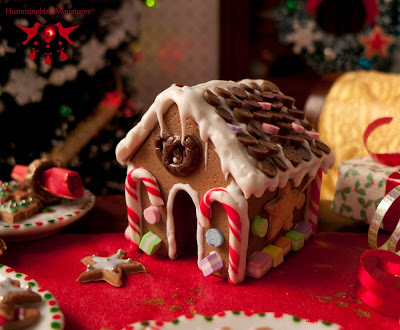 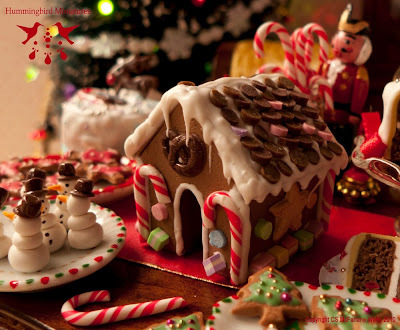 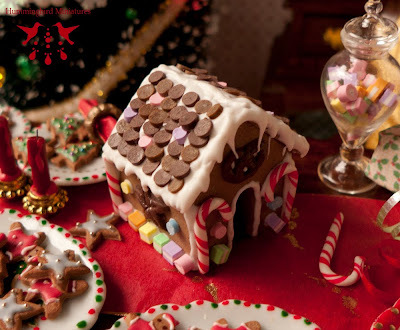 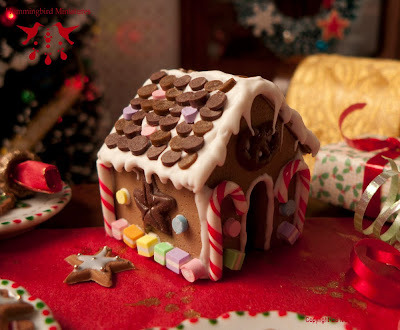 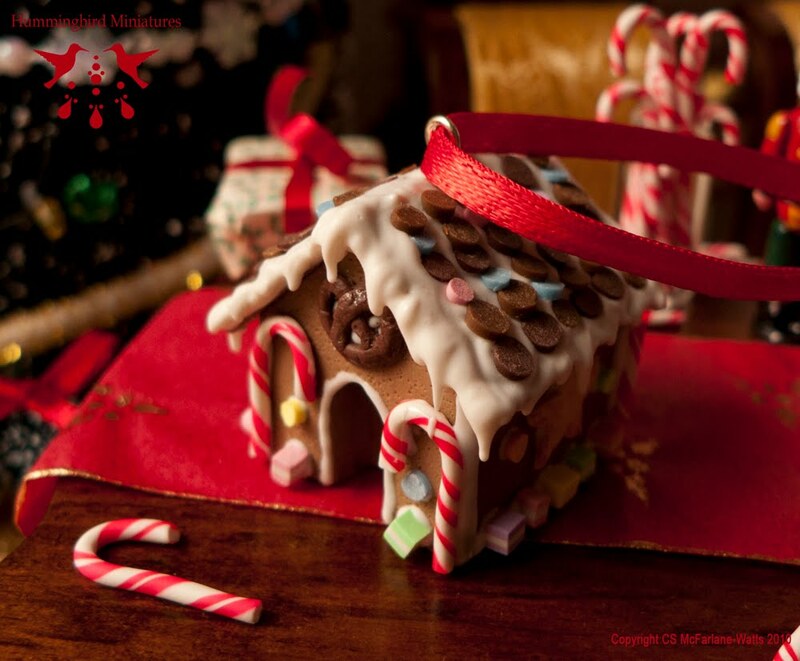 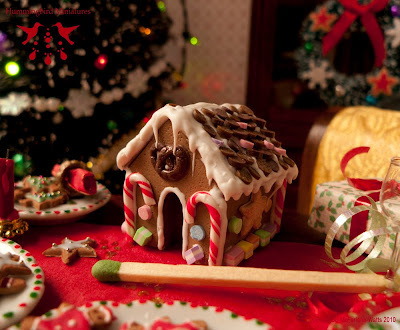 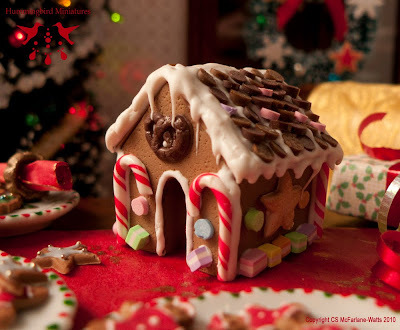 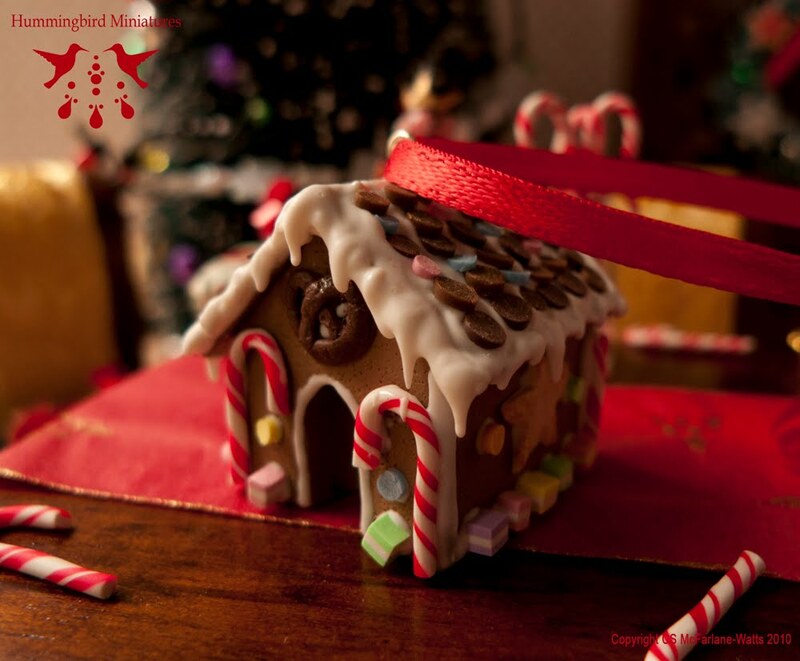 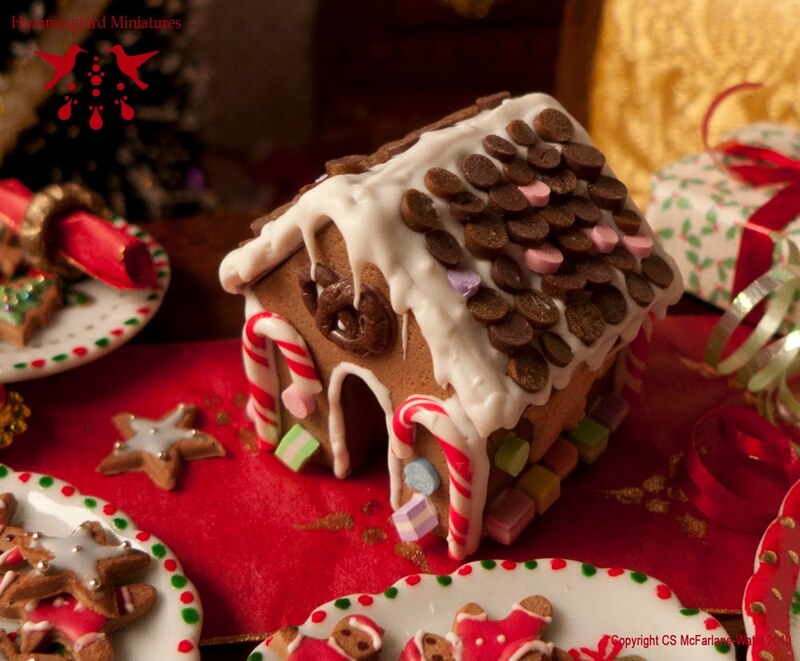 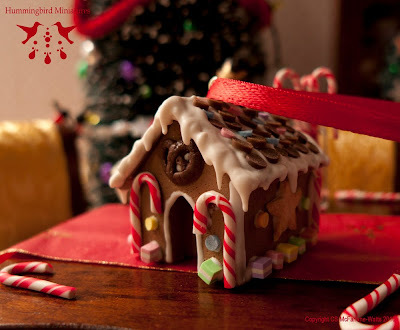 Christmas Candy and Gingerbread Houses! 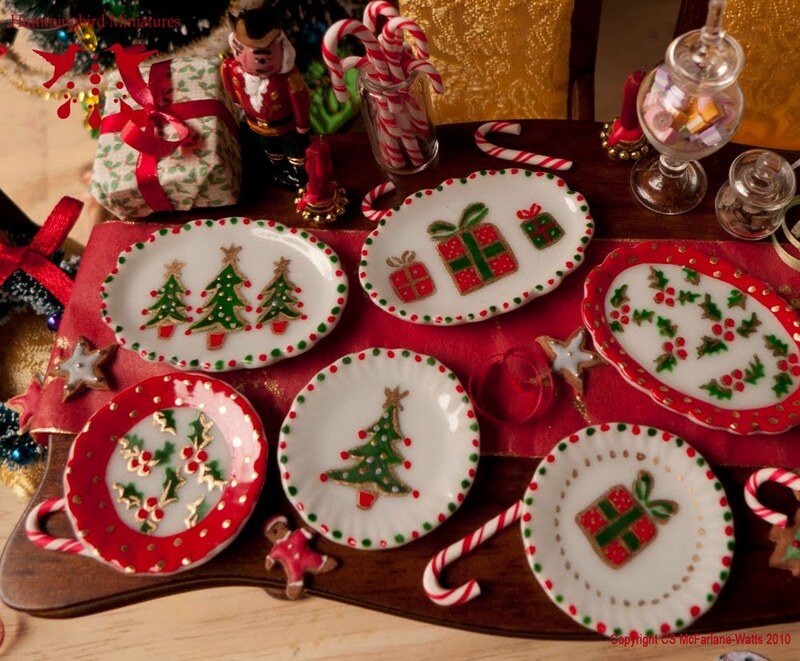 I'll start listing Christmas items gradually starting tomorrow. 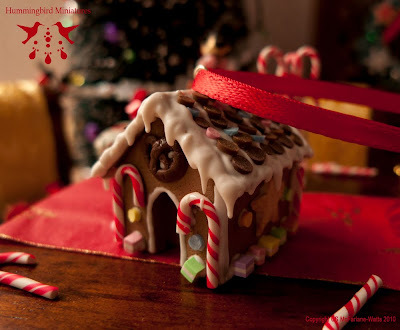 I'll be starting with Gingerbread Houses so I thought as usual I'd share them with you first. :) They are extremely detailed (took me agggges) and lovingly handmade in 1:12 scale from polymer clay. 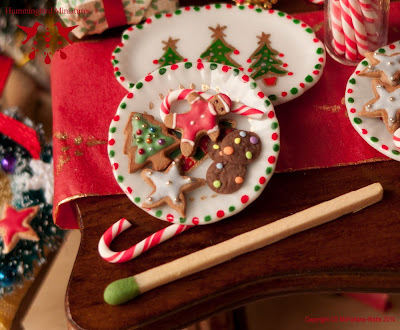 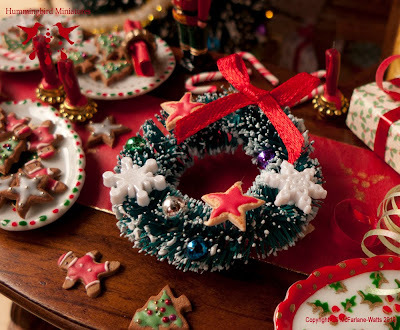 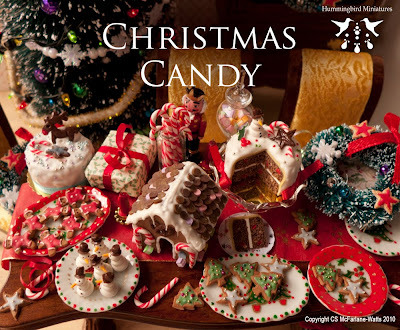 They're decorated with all kinds of candy such as Dolly Mixtures (an English candy which is a lot like Liquorice Allsorts without the liquorice), chocolate buttons, candy canes, chocolate stars, star-shape cookies and white sugar icing. They'll be available on my shop for a little over a week and then I may have to shut the shop temporarily whilst I fly back to Britain for my Christmas vacation.